the Climate Science community continues to ignore the fairly profound implications of what the data actually shows. variations in CO2 and CH4 are both caused by global temperature change and freeze thaw cycles at high latitudes. These natural geochemical cycles makes it inevitable that CO2 and CH4 will correlate with temperature. It is therefore totally invalid to use this relationship as evidence for CO2 forcing of climate, especially since during the onset of glaciations, there is no correlation at all. CO2 in the past played a negligible role. It simply responded to bio-geochemical process caused by changing temperature and ice cover. I left a couple of comments, but only one has appeared, so I thought I would quickly write this post. The reason why the climate science community has probably ignored the profound implications in Euan’s posts is – I think – because they’re not really very profound. Firstly, this is data from a single site (Vostok). Even though greenhouse gases may be well-mixed, the temperature is not. You need to be a little careful when using this single site to infer something about global temperatures, and the relationship between temperature changes and CO2/CH4 changes. Maybe more importantly, though, what the data indicates is not really all that surprising. It is certainly not the case that CO2 is the main driver of the glacial cycles. The trigger for the glacial cycles is probably orbital variations, in particular large changes in solar insolation at high northern latitudes. However, the net change in solar insolation (globally) is small, so it cannot – by itself – produce much in the way of warming/cooling. What is thought to happen is that these changes trigger either ice sheet retreat, or ice sheet advance (depending on whether we’re moving into a glacial, or out of a glacial). This changes the planetary albedo which produces either warming (ice sheet retreat) or cooling (ice sheet advance). This warming/cooling then results in the release/uptake of CO2 from the oceans, and also influences vegetation (which itself produces an albedo change and releases, or takes up, CO2). The change in atmospheric CO2 (and CH4) then produces more warming/cooling, causes further retreat/advance of the ice sheets, and further changes in vegetation. These different processes (albedo changes and changes in atmospheric CO2/CH4) then together produce the temperature changes that move us into, or out of, a glacial period. A key point is that CO2 does indeed respond to temperature changes (through ocean outgassing/uptake and changes in vegetation) and – in the context of the glacial cycles – is more properly a feedback, than a forcing. This, however, does not mean that it is not a greenhouse gas and that changes in its concentration in the atmosphere will not influence global temperatures (it clearly does). We really cannot explain the glacial cycle without including the influence of changes in greenhouse gas concentrations in the atmosphere. This paper by James Hansen and Makiko Sato provides a nice explanation of the process and indicates that changes in atmospheric greenhouse gas concentrations (mainly CO2 and CH4) is responsible for about half of the glacial cycle temperature changes and that this is consistent with an equilibrium climate sensitivity of about 3oC ± 1oC. There are also a couple of nice Skeptical Science posts that discuss the whole CO2 lags temperature issue. Of course, I’m not an expert on this, so may not have explained this as well as I could have. Also, maybe I have missed something and maybe what Euan Mearns has presented is indeed profound and should not be ignored by the climate science community. However, if I have learned something in my years as a research scientist; when you think you’ve discovered something profound and everyone else ignores it, maybe it really isn’t as profound as you initially thought. We show that although low-frequency CO2 variations parallel changes in Antarctic temperature, abrupt CO2 changes occur that have a clear relationship with abrupt climate changes in the Northern Hemisphere. …..We suggest that processes operating on centennial timescales, probably involving the Atlantic meridional overturning circulation, seem to be influencing global carbon-cycle dynamics and are at present not widely considered in Earth system models. Differences between the respective temperature changes of the Northern Hemisphere and Southern Hemisphere parallel variations in the strength of the Atlantic meridional overturning circulation recorded in marine sediments. These observations, together with transient global climate model simulations, support the conclusion that an antiphased hemispheric temperature response to ocean circulation changes superimposed on globally in-phase warming driven by increasing CO2 concentrations is an explanation for much of the temperature change at the end of the most recent ice age. The robust lead of Antarctic temperature over CO2 concentration during several recent glacial–interglacial transitions inferred from the Antarctic ice cores apparently contradicts the concept of CO2-driven climate change and still remains unexplained……….our results provide an explanation for the observed Antarctic temperature lead over CO2 concentration. It is shown that the interhemispheric oceanic heat transport provides a crucial link between the two hemispheres. We demonstrate that temporal variations of the oceanic heat transport strongly contribute to the observed phase relationship between polar temperature records in both hemispheres……Based on our results, we argue that the analysis of leads and lags alone, without a comprehensive understanding and an adequate model of all relevant climate processes, cannot provide direct information about causal relationships in the climate system. And another couple of papers, thanks to Twitter. Does seem as though this isn’t really being ignored. we show that the increase in CO2 likely lagged the increase in regional Antarctic temperature by less than 400 yr and that even a short lead of CO2 over temperature cannot be excluded. This result, consistent for both CO2 records, implies a faster coupling between temperature and CO2 than previous estimates, which had permitted up to millennial-scale lags. There are also two Realclimate posts that cover this issue, and another Skeptical Science post. This entry was posted in Climate change, Climate sensitivity, ClimateBall, Global warming, Greenhouse effect, Pseudoscience, Research, Science and tagged Energy Matters, Equilibrium Climate Sensitivity, Euan Mearns, Glacial cycles, Last Glacial Maximum, Milankovitch cycles. Bookmark the permalink. 82 Responses to What does the Vostok ice core tell us? Vostok leads and lags is an old one. There are now quite a few studies that show instances of CO2 leads. One is the Palaeocene-Eocene thermal maximum. Another is CO2 outgassing in the Southern Ocean at the end of the last glacial maximum. Don’t have refs – on a train with a phone. Another is that correlating a point like Vostok with global CO2 is insufficient to make such an objection as you point out. The final one is that you need to remove CO2 forcing to make this argument work. Given land and ocean responses, if you have an albedo trigger, you would expect CO2 to lag as the oceans and biosphere respond. Again as you pointed out. Years ago I did a power law plot of Vostok temp changes with time. Straight line. It’s a complex system and not amenable to simple correlation. Looks like Mearns made a new argument recently, with CO2 decrease lagging cooling by many thousands of years as evidence CO2 does not cause warming. Vostok leads and lags is an old one. You know what they say about zombie myths. Yes, that’s the post in which he claims that the profound implications of his analysis is being ignored. Yes, the the argument using the «lag» of Vostok is wrong from the start. It is a denialist meme, because it is a counter intuitive observation. By the way, the number does not match what we are observing now. at all. Temperature rise would have need to reach 12 °C, to correspond to the rise of CO2 we have observed. Euan Mearns seems to think that I was questioning that his post has had 8000 reads. I tried to post a comment there to say that that wasn’t my intent, but I can’t seem to comment there at the moment (I’m on a train, so maybe a problem with the Wi-Fi). Anyway, my apologies to Euan if it appeared that I was questioning that claim; I didn’t really have any reason to doubt it, but didn’t think there was any way of checking. > A key point is that CO2 does indeed respond to temperature changes (through ocean outgassing/uptake and changes in vegetation) and – in the context of the glacial cycles – is more properly a feedback, than a forcing. Most of the ice-core records of CO2 and temperature show a lag on the cooling part of the graph between falling temperatures and falling CO2 levels. Which does beg the question; how do you get significant cooling with ‘stable’ CO2 levels. ? I did wonder this myself. One answer is presumably albedo changes (Hansen & Sato does seem to show some quite dramatic drops in albedo). I also wonder if this is also not slightly exaggerated in the ice core records, which will – I think – be showing local temperature changes, but global CO2 concentrations. Actually this is “proof” in some circles that CO2 is a cooling agent even in the lower atmosphere. I wish I were kidding. One of the errors in the argument from the temperature – CO2 divergence found in certain parts of the Paleo record, is that it somehow refutes the known physics of CO2 as a GHG. There is also that weird logic fail that leads people to claim that if warming causes CO2 rise, then CO2 rise CANNOT cause warming. Because such circular causation would feedback to infinity… or something. Most of the time in the paleo data the correlation between CO2 and temperature is quite close. But there are periods of divergence when ‘other factors’ get invoked. Milankovitch cycles triggering the rapid warming events is the most obvious. But the divergence during the slow, noisy but almost immediate cooling after every other glacial meltdown would also seem to need additional factors. Factors that would be quite useful now in de-coupling our rising CO2 level from temperature. One of the errors in the argument from the temperature – CO2 divergence found in certain parts of the Paleo record, is that it somehow refutes the known physics of CO2 as a GHG. Indeed. As far as I can tell, one of Euan Mearn’s arguments is that because of the response of CO2 to changing temperatures, it is inevitable that it will correlate with temperature and – hence – you cannot use this as evidence that CO2 forces climate. Well, I don’t think this is what happened, or is really what is being claimed. The role of CO2 as a greenhouse gas has been for a long time. This has then been used to try and explain past changes which are extremely difficult to explain without some role for CO2 (as is our current warming). There is also that weird logic fail that leads people to claim that if warming causes CO2 rise, then CO2 rise CANNOT cause warming. Quite; this doesn’t make any sense. The paleo back about 400,000 years shows hockey stick shaft cooling and blade warming. Most of the time the Earth was cooling slowly or warming fast. We could accept the slow cooling as normal. Marcott shows cooling for the 6000 years prior to the end of the LIA. Please insert caveats here. If we had ice sheets collapse as the cause of the warming, that may explain the rapid warming. A dry world with water locked up at material elevations. A second idea is that under ice sheets, you get land subsiding. So in the NH you had many thousands of years of ice causing this in places like Northwest Minnesota lowering the elevation of the ice, making it easier to melt. If it melts, you have new lakes, some of them next to the ice sheets, that like the oceans are good solar uptakers. New precipitation from the lakes evaporating, and new vegetation lowering albedo. The Red River runs North and I assume it did that 18,000 years ago. How to melt an ice sheet? Put a big lake slightly uphill from it. The ice advances South and accumulates until the termination threshold is reached. It just took a bath. Previous interstadials seem to show a different pattern. Post melt cooling is MUCH faster. It implys the rapid melt overshoots and results in an energy imbalance that enables rapid cooling after whatever tipping point causes the shift in solar distribution to trigger the ‘hockey stick blade’ melt-down. Paleo evidence is our best indication of what the climate can do. I can accept as a ‘just-so’ story that the Northern hemisphere ice-cap grows until it is unstable and can melt out in less than 2000 years. I can see the coherence of a narrative that different timescales for surface cooling and CO2 sequestration after a glacial melt can explain the divergence between the climate control knob and temperature. I would welcome any information on how you get rapid cooling at the start of a new glacial cycle. Increased snowfall reconstituting a high albedo land cover…? And why it didn’t happen this time round. I’ve added an update to the end of the post that highlights some papers that Gavin Foster and Steve Forden mentioned on Twitter. A big factor appears to ocean heat transport between the two hemispheres. the strong force – ocean currents feeding through to and interacting with dConvection and dCloud cover (alos strong forces) and the weak forces that follow – dCO2, dCH4 and d Albedo – the latter are all over-ridden by the strong forces at every inception and every termination. I’m not quite sure what you mean by this (would appreciate some clarification). However, ocean currents cannot – by themselves – drive long-term warming; they simply move energy around. Of course, they could bring energy to the surface to increase surface temperatures (or away, to cool the surface). However, the Planck response is quite large (for every 1C change in surface temperature, there is about a 3.2 W/m^2 change in outgoing flux). Therefore, any excess energy should be lost quickly (or, energy deficit reduced quickly). In order to sustain some kind of long-term warming/cooling, you do need some kind of feedback response in the atmosphere – clouds, water vapour, lapse rate (which is what I assume you mean by dConvection). However, the feedback response – on average – is expected to be smaller than the Planck response (i.e., less than 3.2W/m^2/K). If anything, it almost has to be smaller or the system would be highly unstable, otherwise internally-driven warming could simply runaway. So, it is very difficult to construct a physically plausible scenario under which long-term warming could be driven internally (there are some possible examples, such as Dansgaard-Oeschger events, but these are associated with ice sheet retreat/advance, not simply cloud, water vapour, and lapse rate). The other problem is that if you are arguing for a high sensitivity to internally-driven warming, why is it not also sensitive to CO2, or albedo, driven warming. The feedbacks simply response to changes in temperature; they can’t know if these changes are due to changes in ocean cycles, or changes in atmospheric CO2. You may also want to look at some of the papers I added at the end of my post; they address some of what you’re highlighting in your post. With the ice cores, as pointed out by others, you’d get a world CO2 level and a regional temperature. We may prefer the CO2 as the temperature proxy. This strengthens my slow cooling suggestion. Because CO2 increase is associated with an atmospheric temperature rise there is a tendency to look at last CO2 rises and say they could have caused the temperature rise. Ignoring the fact that the CO2 rise was not naturally rather than AGW caused. Though, as ATTP says, the CO2 contributes to the temperature rise it is only as an after effect not as a cause. It’s magnitude is expected. That is the CO2 will always rise when the temperature gets warmer and the temperature getting warmer is entirely due to the geochemical cycle. What causes the geochemical cycle is always the problem. Two unexplained issues, the lag and seeming lack of correlation with CO2. There should not be a lag and lack of correlation according to theory. Ignoring the fact that the CO2 rise was naturally rather than AGW caused. Is PAGES 2K also in trouble? I am a fan of small sample sizes but goodness gracious. You think Nuccitelli overstated things a little? If Mearns wishes to recycle and old, tired, logically incosistent idea, the least he could do is update himself with the literature. He’s at least 16 years our of date. For starters, he needs to read Cuffey and Vimeux, 2001 (http://www.nature.com/nature/journal/v412/n6846/full/412523a0.html) and Pedro et al., 2012: http://www.clim-past.net/8/1213/2012/ Among other things, Cuffey and Vimeux show that the purported lack of correlation between CO2 and temperature at Vostok that Mearns refers (about how CO2 doesn’t fall for thousands of years after temperature does, at the end of the last interglacial) reflects the fact that deuterium/hydrogren ratios are not exactly temperature. Pedro et al. show that the lag is not 800 years. It’s more like 0. Thanks. I also saw your tweets, so will add some more links to the papers you mention, and the Realclimate posts, at the end of mine. It’s probably triggered by orbital forcing (changes in solar insolation at high northern latitudes). I don’t know what you mean by a lack of correlation (because I think there is) but we do expect something of a lag, because changes in CO2 is not what triggers the shift from a glacial to an inter-glacial (and back vice versa). However, if you look at some of the papers I’ve added to the update at the end of the post, the lag is probably much smaller than some of the ice core data indicates. Here’s a nice potholer video that also covers this CO2 lags temperature issue. No, both a lag and a correlation are entirely expected according to theory. The solubility of CO2 in the oceans is temperature dependent, hence we would expect to see a correlation. The oceans have considerable thermal inertia, hence we would expect to see a lag. Working out how big a correlation and how big a lag would require a model, rather than just theory. Didn’t see any questions here, just a series of (unsupported) assertions to suggest that the observations were not explained by the theory. Not always the case, I gather there have been times where geological changes have affected the rate of chemical weathering of rocks, which has changed CO2 levels and temperature changed as a result. CO2 is a greenhouse gas, CO2 solubility in the oceans is temperature dependent, which leads and which lags depends on what caused the disturbance from the dynamic equilibrium. All this is very well but glacial cycling didn’t start until the late Pliocene and then in a more substantial way during the Pleistocene. I assume that the global temperature and associated carbon dioxide levels had to fall far enough to start the whole thing. Yet nobody discusses this point. And by the way, the climate is now equilibriating back to the mid-Pliocene so the matters of glacial cycling are now merely academic. Thanks ATTP very useful discussion. I don’t think anyone has mentioned this so far, so …. The CO2 feedback from ocean degassing which occurs at the end of ice ages should be accompanied by a concomitant de-acidification of the oceans. The fact that the oceans are, during this period of warming, acidifying instead is evidence that they cannot be the source of the atmospheric CO2 increase we see since the industrial revolution; indeed since the oceans are actually acidifying, there must be another source of CO2 which is entering both the atmosphere and the ocean. I believe there is paleo evidence for increased ocean acidity at the beginning of glaciation events together which decreasing acidity at the end, consistent with the CO2 as-feedback model, but would welcome a reference, if anyone has one. the climate is now equilibriating back to the mid-Pliocene so the matters of glacial cycling are now merely academic. Indeed, according to this paper, we’ve probably delayed the next glacial period by about 50000 years (despite some people’s concerns). The fact that the oceans are, during this period of warming, acidifying instead is evidence that they cannot be the source of the atmospheric CO2 increase we see since the industrial revolution; indeed since the oceans are actually acidifying, there must be another source of CO2 which is entering both the atmosphere and the ocean. Indeed, and – as I suspect you’re implying – the source is us, through the burning of fossil fuels and the resulting release of CO2 into the atmosphere. aTTP — Thank you but the paper actually suggests 100,000 years given fossil fuel burning. This essentially agrees with “The Long Thaw” by David Archer. But looking at the LR04 stack and how much carbon dioxide we continue to add I’ll suggest more like 1–2 million years before glacial cycling could recompense in a substantial way. Possibly we would rather have a climate more right-on-the-edge. Thank you but the paper actually suggests 100,000 years given fossil fuel burning. Indeed, that – I think – is if we end up emitting 1000 to 1500 GtC. Admittedly, we’ve emitted about 600GtC to date, and are emitting about 10GtC per year, so exceeding 1000 GtC seems quite likely. Hence, it seems inevitable that we will indeed delay the next glacial period by at least 100000 years. Evidence from orbital-scale variations bears on this issue. Work in the 1990’s by the SPECMAP group (John Imbrie and colleagues) showed that Southern Hemisphere ocean temperatures respond relatively quickly to orbital forcing and are a ‘leading indicator’. Because the temperature index in Antarctic ice depends strongly on Southern Ocean temperatures, it too it a leading indicator. Northern ice volume responds more slowly to orbital forcing and is a lagging indicator. Because Northern ice volume drives a major CO2 feedback response, CO2 is another lagging indicator. “Global temperature” is a complex mix of all these signals and is not directly represented by any one paleo proxy. Its timing lies somewhere between the leading and lagging indicators. Thanks for the comment. That clarification is very useful. Correct me if I am mistaken, but isn’t the Cuffey and Vimeux paper really saying that deuterium based temperature measurements are wrongly timed? If so does Oxygen-18 agree? I can’t understand why this is not more widely known, since if true it is rather important. I don’t have access to Nature so can’t read the whole paper. I was trying to be quite precise about what you can infer from the rising ocean acidity. 🙂 It seems to me that if you have rising temperatures and rising ocean acidity, then CO2 is being produced spontaneously from somewhere to act as a forcing – this is the case today and in the PETM. In these situations you don’t expect CO2 to lag temperature, precisely because it is a forcing. During de-glaciations the CO2 is a feedback arising from the warming oceans; because the forcing is not a spontaneous release of CO2 into the atmosphere, Henry’s Law doesn’t come into play and CO2 leaves the ocean since the solubility of gases decreases in a warming liquid. So ocean acidification implies the spontaneous creation of CO2 but it doesn’t preclude a (say) volcanic source for the CO2. However, to my mind, the anthropogenic nature of the CO2 emitted in the last 150 years is settled by the Mass Balance argument. Can we be a little more rigorous? Correlation is not causation. If CO2 and temperature are positively correlated, CO2 may cause warming, warming may cause an increase in CO2, both statements may be true, or both CO2 and warming may be responding independently to a third phenomena. Let’s properly conclude that: “This correlation does not prove that rising CO2 CAUSES OR DOESN’T CAUSE global warming.” Since we don’t know the direction of causation, the correlation ALONE adds relatively little to our understanding of the role of anthropogenic CO2 in FORCING climate change. We have perfectly good evidence from other sources that CO2 is a GHG and that GHGs should cause some warming. That amount of warming depends on ECS. Likewise, the lower solubility of CO2 in warmer water strongly suggests that the ocean should outgas CO2 as it warms. But the ice core data adds nothing new to that information. How much warming could CO2 have caused at the end of the last ice age? The rise in CO2 amounted to about half of a doubling over roughly 5 millennia. If we take the IPCC’s lower limit for ECS of 1.5 K/doubling, the rise in CO2 could have caused as little as 0.75 K of warming or 0.15 K/millennia. Let’s assume a lag of one century or less before rising CO2 began to drive warming. How much CO2 has outgassed from the ocean from roughly 1 K of warming during the 20th century? Now, how much outgassing could 0.015 K of warming have produced at the end of that first century of termination? Zilch. Now let’s assume a far more realistic lag of 1 millennia, which is long enough to bring a lot of deep water to the surface to release CO2 and long enough for 0.15 K of warming to drive outgassing. Still seems pretty far-fetched to me. If ECS were 4.5 K/doubling, we could have nearly 0.5 K of warming and a millennium to get CO2 out of the deep ocean, but still only 2 K of warming (without slow ice albedo feedback). ATTP’s inability to come up with an explanation does not constitute evidence that CO2 must have caused all or even most of that warming. Based on ECS, CO2 causes less than half, possibly far less. To begin with, we have slow ice-albedo feedback (present in ESS, but not ECS) in addition to CO2 feedback that was available to amplify warming. It is possible that ice-albedo feedback, not CO2 feedback, caused the bulk of warming. What about changes in ocean currents due to increased fresh-water runoff and changing sea level? Nor do we fully understand what causes terminations. Of course, if you religiously believe that CO2 is the master control knob for ALL climate change, only one explanation is possible. Can we be a little more rigorous? We could be, but I don’t think your comment really qualifies. There are many lines of evidence that indicate that CO2 causes warming; it’s not simply based on some correlation with temperature. ATTP’s inability to come up with an explanation does not constitute evidence that CO2 must have caused all or even most of that warming. Well, it didn’t cause all of the warming/cooling associated with the glacial cycles; it causes about half, the other half being due to albedo changes. Eric: Why would anyone accept the conclusions of Pedro et al., 2012: http://www.clim-past.net/8/1213/2012/ over those from the Vostok Ice Core. In the Vostok Ice Core, one is measuring temperature proxies and CO2 levels in the same sample. Pedro is getting his temperature and CO2 data from partially different sources. Therefore any dating error over 17+ kyr can invert the conclusion about which came first: rising CO2 or rising temperature. It appears far simpler to compare Vostok T and CO2, Siple T and CO2, and Byrd T and CO2 and then, if appropriate supplement that straightforward analysis with information from other sites. Furthermore, rising CO2 can diffuse through the firn for at least a century after the temperature proxies are locked into the ice. If anything, simultaneously rising CO2 and temperature proxies is indicative of temperature rising before CO2. This correction factor should be bigger for slower accumulating cores than faster ones. Did you read Eric’s comment? Among other things, Cuffey and Vimeux show that the purported lack of correlation between CO2 and temperature at Vostok that Mearns refers (about how CO2 doesn’t fall for thousands of years after temperature does, at the end of the last interglacial) reflects the fact that deuterium/hydrogren ratios are not exactly temperature. Pedro et al. show that the lag is not 800 years. It’s more like 0. ATTP, it looks like Frank did not even read the introduction to Pedro et al, either. They explain nicely why the direct comparisons at single sites is likely more problematic than their approach. It is too simplistic to say that some mixture of Orbital,CO2 and Ice Albedo can explain glacial cycles over the last 800k years. That is simply not the case because it doesn’t explain the timing. This is still an unsolved mystery. Attempts to explain the last million years of glacial cycles have concentrated mainly on the growth of Northern Ice sheets. Traditionally the summer insolation at 65N is thought to control the growth and extent of ice sheets, with interglacials coinciding with summer melt-back. A new paper href=”https://www.sciencedaily.com/releases/2017/01/170126130856.htm”>Hemispheric sea ice distribution sets the glacial tempo argues instead that Antarctic sea-ice sets the timing of glaciations. The Southern Hemisphere has a higher capacity to grow sea ice than the Northern Hemisphere, where continents block growth. The proposal is that a rapid growth in annual sea ice coverage in the southern hemisphere reduces the earth’s net albedo enough to initiate a new ice age leading consequently also to the growth in northern ice sheets. However this does not explain how ice ages end. This seems always to be triggered in the Northern Hemisphere at maximum arctic insolation. But then again not every Arctic maximum! You really do need to look up Strawman (okay, maybe you know what it is and are savaging them on purpose – you’re certainly pretty skilled at it). The point is that the change in temperature that occurs during the glacial cycles is mainly due to changes in GHGs (CO2 and CH4) and albedo. This doesn’t mean that they are the trigger for these changes, as this is probably associated with orbital forcing, but it is a complex issue and I don’t think anyone really claims that we know for sure what triggers the changes. Clivse says Frank is right. About this? It is possible that ice-albedo feedback, not CO2 feedback, caused the bulk of warming. What about changes in ocean currents due to increased fresh-water runoff and changing sea level? So, somehow our climate is more sensitive to ice-albedo feedback than to CO2 feedback? How does that work? What about changes in ocean currents, how do they produce long-term warming/cooling? In fact, for the latter, I’d be quite keen on some kind of answer, because it seems quite common for people to invoke changes in ocean currents, but rather rare for them to explain how this can produce long-term changes in global surface temperatures. So, somehow our climate is more sensitive to ice-albedo feedback than to CO2 feedback? How does that work? Part of the problem is conceiving of climate as global mean temperature. 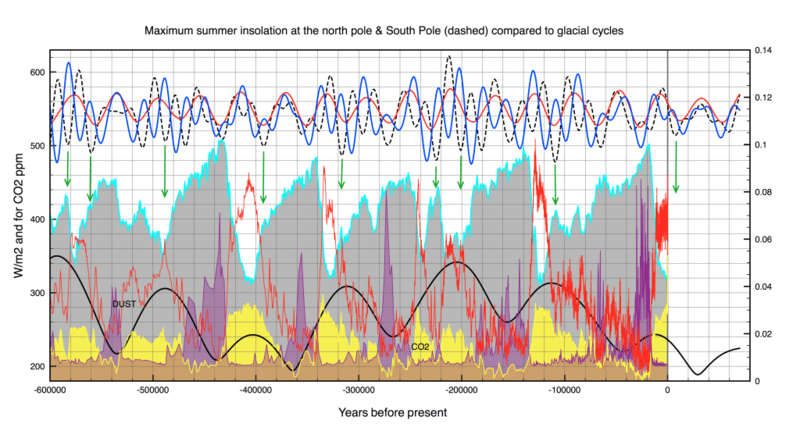 The glacial cycles are not determined by global mean temperature. Rather, glacial cycles are simply bi-stable states of peak net summer radiance specifically where ice might persist. The effect of ice albedo on maximal summer time radiance from 45N to 83N is much larger than the orbital effect which is thought to start the process. And the orbital effect is larger than the CO2 effect. So the accumulation of ice is in the largest part a function of the presence of ice. Variables which depend on themselves mean chaos, which is why there’s not a neat correlation as Clive points out. Also, another chaotic factor of ice is this: kilometers thick ice sheets are some 10C to 15C cooler than ice near sea level because of the elevation of ice. Take all the ice of Greenland, and spread it out evenly over the same latitude band and it would quickly disappear. But ice continues to accumulate on Greenland because the elevation means much lower maximal summertime temperatures. None of what you’ve presented indicates that a fixed change in forcing due to ice-albedo feedback will produce a much larger change in global temperature (which is what we are talking about) than the same change in forcing due to CO2. Climate sensitivity refers to the change in global temperature due to a change in forcing (whether albedo or CO2). You can’t change the definition of a term in order to imply that what someone has said is wrong (this is obvious, right?). Yes, I think I’ve said this time and time again. Noone is claiming that the trigger for the glacial cycles is changes in CO2 (do you and Clive get together to decide which strawman you’re both going to savage, or do you do so independently?). However, what ultimately produces the change in temperature is changes in albedo and changes in CO2 and there is no indication that a change in forcing due to albedo will produce a much larger response than the same change in forcing due to CO2. As far as but chaos goes, why not read the discussion in this post? It is possible that unicorn feedback, not CO2 feedback, caused the bulk of warming. On a per unit basis, the RF from albedo change and the RF from GHG change have the same effect on global energy balance. the RF from ice albedo was about 3 times as large as that from CO2 in the global mean. What do you mean? According to Figure 3 of this paper, the change in forcing due to GHGs (which is mostly CO2) is similar to the change in forcing due to albedo. Together, they give an ECS of about 3 &#plusmn; 1C. Absolutely. As I read it, Cuffey and Vimeux are discussing the lag in the initiation of the most recent Ice Age, not the more abrupt terminations of ice ages that provides a clear measure of lag. The isotopic fractionation during evaporation, transport and then precipitation over Antarctica creates the possibility that major climate change can perturb the relationship between “temperature” and isotopic ratios. But, once you open that can of worms, you cast doubt on the whole strategy of using ice cores to measure temperature. AOGCMs make dramatically different predictions about regional climate change. One can propose/discover a model for correcting isotope data, but I doubt there is any way it can be validated. Speaking cynically, one might be able to find a model that will make the data say anything you want it to say, but I shouldn’t say that without having read all of the details (it’s behind a paywall) to see how convincing the arguments are. When one has wide latitude in “refining” data, my confidence in the output drops – unless those refinements resolve other discrepancies that were not being studied when the refinement was devised. No, I don’t think this is correct. The warming has probably incfluenced atmospheric CO2 in the sense that the oceans have taken up slightly less than they would have had we not warmed by 1K. The response of the upper regions of the oceans is quite rapid. My faith in climate scientists diminishes when I see them behaving as policy advocates and writing scientific papers claiming the lag is zero – a mechanistically absurd idea – as best I can tell. Who is claiming a lag of zero; in this context, there is simply a suggestion that there is not nearly as large a lag as some datasets might suggest. The only person I’ve encountered who has claimed that warming to equilibrium is instantaneous is Christopher Monckton. ATTP wrote: “Well, [CO2] didn’t cause all of the warming/cooling associated with the glacial cycles; it causes about half, the other half being due to albedo changes.” and later asked about quantifying CO2 and surface albedo feedbacks. Great idea. For CO2, we have a little less than half a doubling of CO2 and perhaps 5 K of warming: That’s -0.6 W/m2/K. For ECS to be 1.5 to 4.5, the sum of all fast feedbacks must be -0.75 to -2.4 W/m2 (assuming I calculated this correctly). If we knew the size of the initial forcing (in W/m2) that caused termination, then we could calculate the surface albedo feedback needed. Unfortunately there is negligible GLOBAL forcing associated orbital mechanics, which implies that ESS is very large (at least in the temperature range between glacial and interglacial). If we accept this sketchy rational, the sum of all feedbacks (including Planck feedback, +3.2 W/m2/K) must be near 0. That implies a surface albedo feedback of -1.8 to -0.2 W/m2/K. If these back-of-the-envelop calculations were meaningful and correct, that would imply that surface albedo feedback could be anywhere from 1/3 less important to 3-fold more important than CO2 feedback at driving us out of ice ages. For CO2, we have a little less than half a doubling of CO2 and perhaps 5 K of warming: That’s -0.6 W/m2/K. For ECS to be 1.5 to 4.5, the sum of all fast feedbacks must be -0.75 to -2.4 W/m2 (assuming I calculated this correctly). No, I don’t think you have done this correctly. To determine the ECS from the glacial cycles you combine the GHG forcing AND the albedo forcing and compare that with the change in temperature. So, we have a change in temperature of about 5K and a total change in forcing of about 6.5W/m^2, so an ECS of 0.75K/W/m^2, or about 3C per doubling of atmospheric CO2 (± 1C). See page 5 of this paper. You seem to be fixated on the trigger for the switch from one glacial state to the next. Even though the net change in orbital forcing is small, there are large changes at high latitudes that can act to trigger ice sheet retreat/advance. So, they orbital forcing doesn’t produce much of a change in global temperature (this is mainly changes in GHGs and changes in albedo) but it can still be the trigger that pushes us from one state to the other. Good thinking – the paragraphs I quoted came from the end of the introduction. I believe that their rational was that sites with slow accumulation have a longer period before the firn is compacted and CO2 can not longer diffuse. That leads to greater uncertainty in dating CO2. So they are trying to look at faster accumulating sites where d(age) is smaller. Unfortunately, there many complications at the faster accumulating sites, so Pedro used a composite temperature record. As noted by a reviewer, Pedro et al aligned their dates using CH4 for Greenland, which appears to introduce the same d(age) issues as CO2, except that the errors add when aligned with CH4 in Greenland cores. (This is an open review paper, so you can read some of the discussion of the issues. a) The 800 year lag at Vostok apparently has been proven wrong. b) The climate of faster accumulating sites near the coast differ significantly from central East Antarctica. 1) If the lag is less than a millennium (order of magnitude), warming couldn’t have caused much outgassing of CO2 (otherwise it would have in the 20th century). If warming didn’t cause outgassing because the lag is too short, then orbital mechanics must have caused the outgassing. 2) If the lag is too short, we have an immediate and fairly tight linkage between CO2 and warming that began termination. However, most of the melting ice was in the NH and warming in Greenland lagged warming in Antarctica by three millennia of rising CO2. Rising CO2 didn’t cause warming in Greenland for 3 millennia, even though D-O events show that Greenland’s temperature was very volatile back then??? Then warming see-sawed between the two hemispheres with CO2 following Antarctica. Then Greenland returned to near ice age temperature despite 270 ppm of CO2 for the Younger Dryas. Neither Antarctica nor Greenland proxies represent anything like “global temperature”. Currently CO2 is causing negligible warming in Central Antarctica and its largest effects are in northern polar regions. Ocean sediment cores are probably more relevant proxies for GMST, outgassing of CO2 and feedback from CO2, but they are harder to date for measuring lag. The limited records we have from glacial termination illustrate a phenomena radically different from what we expect CO2 from today. Whatever rising CO2 caused or didn’t cause early in termination, it isn’t very relevant to our future. In version 1, CO2 lags temperature by one period (a millennia). In version 2 – with slightly different baselines – there is no lag. So the temperature of the baselines before and after termination has a big impact on the measured lag. However, most of the melting ice was in the NH and warming in Greenland lagged warming in Antarctica by three millennia of rising CO2. Rising CO2 didn’t cause warming in Greenland for 3 millennia, even though D-O events show that Greenland’s temperature was very volatile back then??? Can’t really follow the logic of this being a problem specific to a near-zero Antarctic lag, assuming this is a reasonably accurate summation of the issues. If the Antarctic lag is 1000 years what you’re presenting here still suggests 2 millennia of no Greenland warming following CO2 rise. Why be concerned about 3 millennia but not 2? At a basic level the consistent glacial-interglacial swings of the past million+ years suggest to me a bi-stable or bounded situation, whereby the various aspects influencing the carbon cycle tend towards quasi-equilibrium at either ~280ppm or ~180ppm. For that reason I’m not sure the net carbon cycle feedback seen during deglaciation has much relevance (in a simple linear statistical sense at least) for the past hundred years of pushing beyond the upper boundary, or next hundred years. And vice versa: it’s quite plausible to me that net CO2 feedback over the past hundred years has been zero or negative, and that says nothing about net CO2 feedback during deglaciation. I’m not sure why you think a lag of less than a millennium would mean an increase in CO2 would be expected at the beginning of the 20th century? Did we have sustained global warming since around 900 CE? Where do you get this 3 millenia lag? I usually see numbers around 1000-1500 years. Marco: Where do you get this 3 millenia lag? I usually see numbers around 1000-1500 years. Many assert that warming at the end of ice ages was mostly due to rising CO2 (presumably from outgassing of warmer oceans) At the end of the last ice age, warming in Greenland ice cores lagged warming in Antarctic ice cores by about 3 millennia. In the 20th century, temperature is rising much faster in Northern polar regions and there has been negligible warming in Antarctica so far. Why do we have two radically different geographic patterns of warming if both are mostly caused by CO2? Answer: The world was a very different place at the beginning of termination and at the beginning of the 20th century. Great. So why do we believe that the effect of rising CO2 during termination has any relevance to the radically different situation we face today? ATTP: Thanks for the reference to Hansen Figure 2. Hansen appears to be calculating “climate sensitivity” from the “forcing” produced by outgassing of GHG’s and changes in surface albedo between the LGM and the Holocene. I don’t know why he calls these “forcings”. IMO, they are feedbacks that amplify a small forcing from orbital mechanics. Since he doesn’t call these feedbacks – and they are responses to warming – he has forgotten to add fast feedbacks (Planck, WV, LR, cloud, and fast surface albedo feedbacks) to these slower feedbacks (that he calls forcing). There was certainly less water vapor and less CO2 in the atmosphere at the LGM and Hansen has ignored the change in WV. Hansen cited publications showing that surface albedo feedback is slightly larger than feedback from GHGs. I didn’t have any information about surface albedo feedback – so I tried to calculate it. Global orbital forcing is negligible, so it must had been amplified enormously to produce 5 K of warming. Enormous amplification occurs when the sum of all feedbacks is near zero. So I summed all of the feedbacks and asked how big surface albedo feedback must have been to produce a total near zero. ECS is determined by the sum of the fast feedbacks. (When we calculate ECS from energy balance models or climate models, there has been little feedback from outgassing of GHGs and changes in surface albedo.) So the IPCC’s range for ECS (1.5-4.5 K) gives me the sum of the fast feedbacks including Planck feedback: -0.75 to -2.4 W/m2/K. For outgassing of GHG’s, I considered only CO2 but came up with Hansen’s answer for all GHGs: 3 W/m2 divided by 5K = +0.6 W/m2/K. So, surface albedo feedback needed to be +1.8 to +0.15 W/m2/K. Hansen’s cited -3.5 W/m2 (+/- 1 W/m2). Dividing by a temperature change of -5 K, that is a feedback of +0.7 W/m2/K (+/-0.2 W/m2/K). I tend to over-emphasize the difference between forcing (a change at the TOA caused by something besides a change in surface temperature) and feedback (a change at the TOA in response to a change in surface temperature). I don’t understand why Hansen uses a different definition in this paper. ATTP wrote: “No, I don’t think this is correct. The warming has probably influenced atmospheric CO2 in the sense that the oceans have taken up slightly less than they would have had we not warmed by 1K. The response of the upper regions of the oceans is quite rapid. If you look at CO2 levels for during the 97/8 El Nino and the following La Nina, you’ll see that CO2 rose during the El Nino by about 1 ppm more than usual and about 1 ppm less than usual during the La Nina. The period is short enough that the temperature change and CO2 change both came from the mixed layer. So 0.5 K of warming releases something like 1 ppm of CO2 from the mixed layer – as best I can tell. It takes about 1500 years for the MOC to bring most of the deepwater in the ocean to the mixed layer, from which it can rapidly equilibrate with CO2 in the atmosphere. CO2 in the atmosphere fell slightly during the LIA, but that was less than 10 ppm (IIRC). So it doesn’t look like changes in surface temperature produce significant changes in atmospheric CO2 during a few centuries. This is another reason why I think the lag between the initiation of warming and outgassing of CO2 must have been a millennium instead of a century (in order of magnitude). Your claim was that it would take a millenium for warming oceans to release CO2 (or, at least, that is what I took you to be saying). I was simply pointing out that I didn’t think this was correct. You don’t need a millenium because it happens faster than that. Frank, quite the non-answer. I asked you where you got your information from, and you decided to just repeat your claim! There’s plenty of work going on on the Polar Seesaw (Stocker & Johnsen, 2003 appears the seminal paper to start from), and a recent paper used a climate model to help explain the lower warming rate of antarctica (Armour et al, 2016). Hint: ocean currents. Marco and ATTP. Sorry my replies were not satisfying. Marco: Does the existence of a polar see-saw in the past mean that we should expect aCO2 to produce warming at alternating poles in the future? Or a delay in warming of 3 millennia in Greenland compared with Antarctica? Our models don’t think so. Nevertheless the warming produced by outgassing of CO2 during termination was associated with the strange phenomena. Is there any reason to assume that what happened during the last termination tells us anything about what will happen as CO2 rises in the 21st century. My other information: 20th century warming of 1 K in one century. No one is attributing any of the 100 ppm rise in CO2 to outgassing from the warmer ocean. Half of anthropogenic emissions disappeared into the ocean. During the fluctuations in temperature between 1000 and 1850, there was almost no change in atmospheric temperature. The exact amplitude and duration of those fluctuations are somewhat uncertain, but lets assume 0.5 K for at least two centuries. Now, it took at least 5 millennia for the temperature to rise 5 K during termination. 1 K/millennia. 0.1 K/century. Based on the twentieth century or 1000-1850, how much CO2 outgassed in the first century and the first millennium of termination? How much forcing could that CO2 have produced? How much warming should have been associated with that forcing? Third time you say this, third time you provide no reference whatsoever. Seriously, what is so frikkin’ hard about providing a reference?! we show that the increase in CO2 likely lagged the increase in regional Antarctic temperature by less than 400 yr and that even a short lead of CO2 over temperature cannot be excluded. What is your point again? This paper is mostly about a different lag, the lag between warming and the rise in CO2. The obvious approach is to measure CO2 and temperature from the same ice samples. Unfortunately, there is a long delay between depositing stable isotope temperature proxies as ice and trapping CO2 in that ice, especially at slowly accumulating sites like Vostok. The solution to this problem is to measure both in the same sample of ice at fast accumulating sites. The inability to obtain an accurate CO2 and temperature chronologies from a single fast accumulating ice core suggests to me systematic problems that won’t be solved by more complicated schemes. Ironically, the fastest accumulating cores are found in Greenland. However, no one uses those cores because it is well known that the rise in CO2 predated warming in those cores by several millennia. There is a bug (feature) of the software that Euan uses for his website that causes the Post Comment button to disappear when typing comments over a certain length. However, there is workaround. After you have finished typing your comment, press the TAB key on your keyboard and the Post Comment button should reappear. Thanks, I will try to remember that. The elephant in the room is what causes the cycle to begin its cooling phase. Time and again I see this question being asked but not answered. Let us accept that we reach a point in the Milankovitch cycle where the temperature is nudged upwards with a force of “F”. We are told that this force is not enough to achieve the full extent of the temperature swing. So let’s assume that a positive feedback mechanism does indeed kick in – an increase in temperature leads to an increase in CO2 leads to increase in temperature. And let’s assume, for the sake of argument that this amplification has a force of 5F. This force takes us to the upper temperature limit in the Vostok Ice Core graph. Now, in order to reverse this force, there has to be force downwards in excess of 5F. The Milankovitch cycle mechanism will not cut the mustard – it only has a force of F. So, what is that force. It certainly isn’t anything to do with a drop in either CO2 or temperature because both those forces are hard on and in the direction of greater atmospheric CO2 and higher temperatures. It seems to me that we need to talk about this elephant. What is this great force that reduces the temperature and the CO2 at the top of the cycle? It’s a big force and until we understand that we are nowhere. I don’t fully understand what this elephant is. In the Milankovitch cycles, the changes in atmospheric CO2 and changes in ice aldedo (due to changes in the ice sheets) are treated as a forcing. In going from a glacial to an interglacial, these changes produce a change in forcing of about 6.5 W/m^2 and an increase in temperature of about 5K (Equilibrium sensitivity of about 3K). When it reverses, the ice sheets grow (albedo goes up) and CO2 is taken up by the natural sinks (atmospheric CO2 goes down) and there is change in forcing again of 6.5 W/m^2 and a reduction in temperature of about 5K. To be fair, the exact details are still not entirely clear, but I think it is mostly thought to be associated with large changes in solar insolation at high northern latitudes (even though the overal change in solar insolation is small). Most of humanity’s progress has been from single persons who insisted that their theories were right, in spite of a massive resistance from the “established science community”. Just because there are examples of profound theories that were right and were ignored by the established science community, doesn’t mean that it’s likely that someone who thinks that have a profound theory that is being ignored is right. I am sure that Kjell will now give us at least 10 examples of such single person and massive resistance from the scientific community. Should be easy to find these 10 examples, if most of humanity’s progress has been from such cases. I don’t think that is remotely the case. Most progress in science is made by incremental improvements that you never get to hear about. A lot of what remains is made by people who make great discoveries, but are very well regarded by mainstream science (e.g. Newton, Einstein, etc.). Gallileos/Wegener’s are very rare (and Wegener would have had less resistance if he actually had a plausible physical mechanism). Darwin would be somewhere in the middle (as he had both opponents and supporters in the scientific community). Crackpots on the other hand are extremely common, they are everywhere; there are even a few in the scientific community that has a selective pressure against loss of self-skepticism. Hmmm…I wonder whether Kjell would be willing to refer to people like Guy Callendar. I’d like to return to Peter’s questions above regarding the mechanisms by which the system returns to a period of glaciation. This would seem to me as a crucial question to explore if we are to somehow address the current climate crisis (or to have it addressed for us). The data shows that the cycle of warming and glaciation has occurred without human involvement in the past, despite high levels of CO2 in the atmosphere, even if we are exacerbating the issue. This would suggest the system has a response mechanism built in which goes beyond orbital fluctuations. What is this response? Is there any evidence to suggest it is an increase in volcanic activity? Is it a biomass increase as the ice caps melt and forests increase in the northern latitudes? Does the rising ocean levels means the oceans are absorbing more CO2? Yes to all of these?? My concern is the trends and data are concerning enough for us to want to try to solve the CO2 problem in dramatic ways but we don’t yet know what the system itself will do to course correct as it has done in the past. Thus we could end up with an over-response at worst or wasted effort at best. Reducing emissions is still arguably a worthy goal. However, we need a better grasp on the inflection point causes. It is possible the response mechanism may simply be more dramatic (i.e. catastrophic) in proportion to the problem, much like the human body runs a fever. Assuming we will just spin off the rails into higher and higher temps seems too linear of a forecast when this has not been the case before. I will continue to search for answers in the research but am curious as to what others are seeing along these lines.